Discussion in 'Random Ramblings' started by TammyTX, Aug 6, 2009. So, I get home at 2:15 and my husband is already home because they got off early today. I go inside start talking and then lay down for my short afternoon nap. About 1 1/2 hours later I'm talking to my husband and suddenly I remembered! I DIDN'T COLLECT EGGS TODAY! By now its really hot, like 102 or something. I rush outside with my egg basket and find 12 intact eggs and 5 that had been eaten or hole pecked and one that was covered in yolk....oh, and fire ants! FIRE ANTS EVERY WHERE! I reach in and start putting all the soiled shavings in a (new) kitty litter pan I had out there as a back-up nest (didn't work btw). Of course the shavings are sticky and the ants are sticking to the shavings so NOW I have fire ant bites from hell all over my hand and I can't shake them off! I know, D'OH! After I clean up the mess I start looking for the culprit. Uh-huh, I find her. One of my EE'rs. Her beak has sticky yolk and bits of shavings on it and her muff is stiff...she's the one, alright. She was referred to as one of the "Lucy's" before because she's red....now she will forever be known as "EE"....not for Easter Egg but for EGG EATER. I run inside to wash the fire ants from hell's now corpse off my hand. I then run back outside because I noticed EE was inside another nest and I still had three girls in there trying to do their egg laying. ........THEN THE CHICK HITS THE FAN! Okay, not a real fan, just replace CHICK with a similar sound word that starts with an "S"....! of course) comes in and just shakes his head. Oh, and yeah, I did get her marked! Hmmmm could you explain that one more time? Quote:That was my thought. Marking her for dinner. Quote: YES! I didn't think of that but, YES!!! ..supposed no one wants to hear how I just got home from Walmart and I went to shut the mister hose off and my legs were swarmed with thousands of fire ants AND they even bit my face??? Maybe I should go to bed. I only ended up with 16 eggs today and I had 24 yesterday. If I continue to have problems with the EE then she will become food. I had a rooster that got mean, this is what he became. 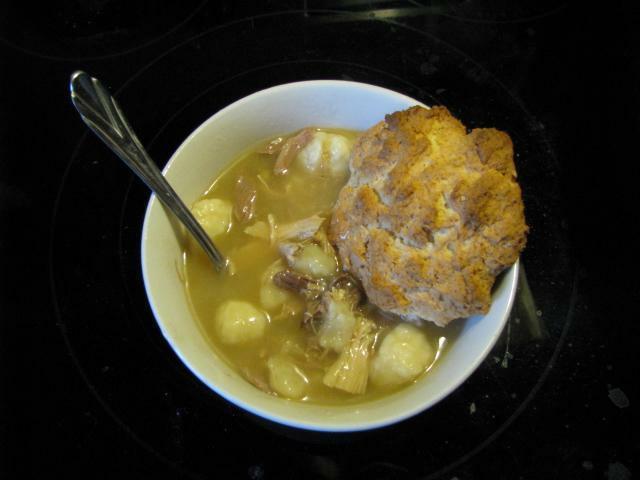 A very delicious pot of chicken-n-dumplings.